Griffin is 7+ months old and zooming ahead on things I'm totally not ready for! 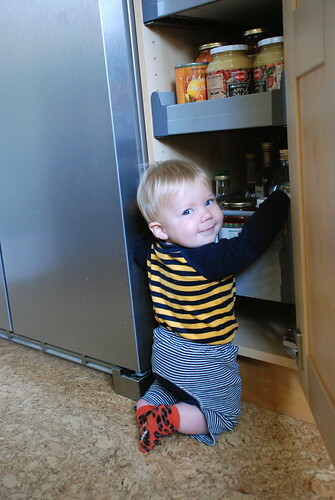 Case in point...finding him climbing the pantry drawers, trying so so hard to grab that bright red box of Indian food. Before I knew it he was moving along to the next thing - not happy to just be on his knees, of course! So now he's pulling up to stand. Really? At 7 months, is this normal? And if I hold his little chubbers of hands he'll WALK from room to room. Maybe I shouldn't be encouraging this behavior. Lest I have a 9 month walker. Griffy is just the sweetest and cutest at 7 months...we don't want him to keep growing :o) He has both bottom teeth (got those while Jared was traveling, along with a cold). Then a top tooth poked its way out a few days ago, followed by another cold (this time with a cough). I'm sure the next top tooth is coming soon. But really hoping for no more colds for a while, please?